InLoox provides its own division structure that is independent of the division structure in Outlook. The InLoox division structure is only available within the InLoox PM Enterprise Edition. The division structure can be subdivided into as many levels as needed. You can assign whole division to a project. 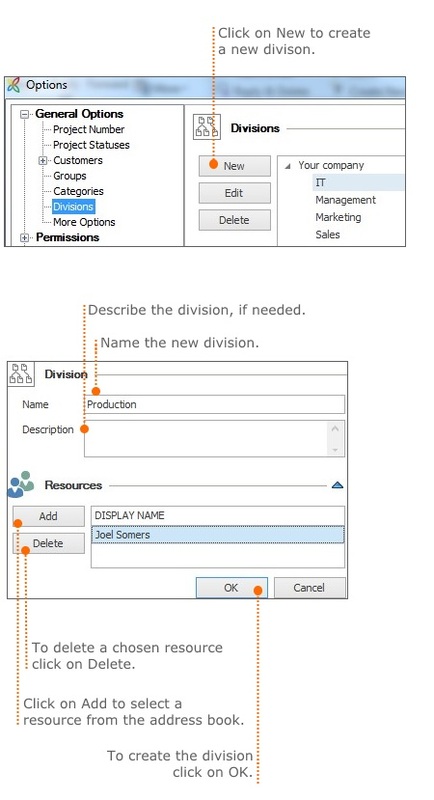 Additionally, the division structure supports you in assigning tasks to resources. 2. Select General Options and click on Divisions. Choose a division and click on Edit to customize the chosen division. Click on Delate to remove a chosen division from the division list. The renaming of a division immediately affects all relevant projects. The deletion of a division immediately affects all relevant projects. A new division is visible on the management and tasks page when adding a resource. Adjust the division structure in InLoox 9 • Copyright 1999-2019 © InLoox, Inc. All rights reserved.